We made it to 100! Thanks for tuning in, sending emails, helping us, and building relationships. We do this because not only do we hope to give you the listener value, but you guys (and gals) help us when we need it too! Technology and the people that use it really are amazing. Brecht sent out the “Bat call” to WordPress gurus on Twitter and received a great response. A tip from Travis Northcutt helped Brecht improve page load speed by over 99% ! Scott is not missing those corporate meetings he used to attend (who would miss those? ), but having corporate clients means he has to be involved in them sometimes. That being said, even within the corporate environment you can find salvation. Hear how Scott is helping train a young, eager, and talented junior developer for one of his clients (and getting paid). Are you on email lists that always send out “tips”? 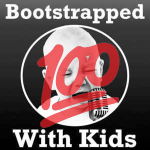 Rethink those tips as Brecht and Scott dissect what they can and can’t do for you in the 100th episode of Bootstrapped With Kids!